Today wasn't a whole lot better. I ate more food (two whole bananas and some toast! ), made it through the work day, and promptly crashed in the couch when I got home. 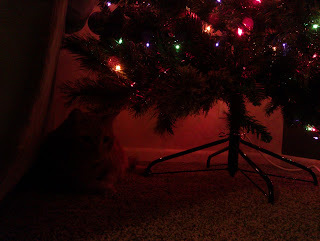 Leki spent a big portion of the evening under the Christmas tree while I watched a lot of Netflix. Do you know how awesome Netflix is for sick people? No terrible commercials and crappy cable programming. I can just stream whatever series I was watching. Netflix has been pretty useful the last few days.